How does a garment go through production? How is the information structured in a basic 'tech pack'? Learn two easy grade rule formulas to populate measurements. Decide the layout & format of your tech pack template. Understand the construction page to get great sewing. Learn how to insert pictures and photos into the tech packs. Take your tech pack with you. 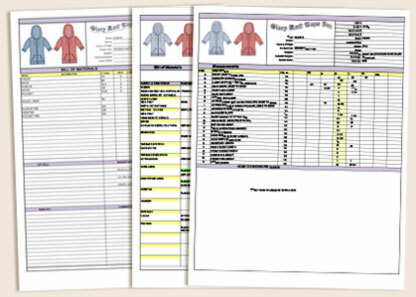 Workbook & support files with sketches included. Learn more about this workshop at the Illustrator for Fashion Professionals website. If you are not sure the meaning of a tech pack, you may want to first read the tech pack term here on Apparel Search. After you read that information, you can sign up for the workshop to learn more. The Illustrator for Fashion Professionals workshop is in conjunction with Fashion Business Incorporated. You can learn more about the Fashion Business Inc. here on Apparel Search or visit their website. On-site training is conducted at the Fashion Business Inc. resource center. Their computer lab accommodates up to 15 trainees at one time, but most class sizes do not exceed 8 trainees. This assures that everyone participating in the training will have time to engage with the instructor personally. The training they do at the FBI is not limited to Adobe and Microsoft (see details of each specific workshop before attending). The FBI offers training for fashion professionals in in a wide range of subjects.